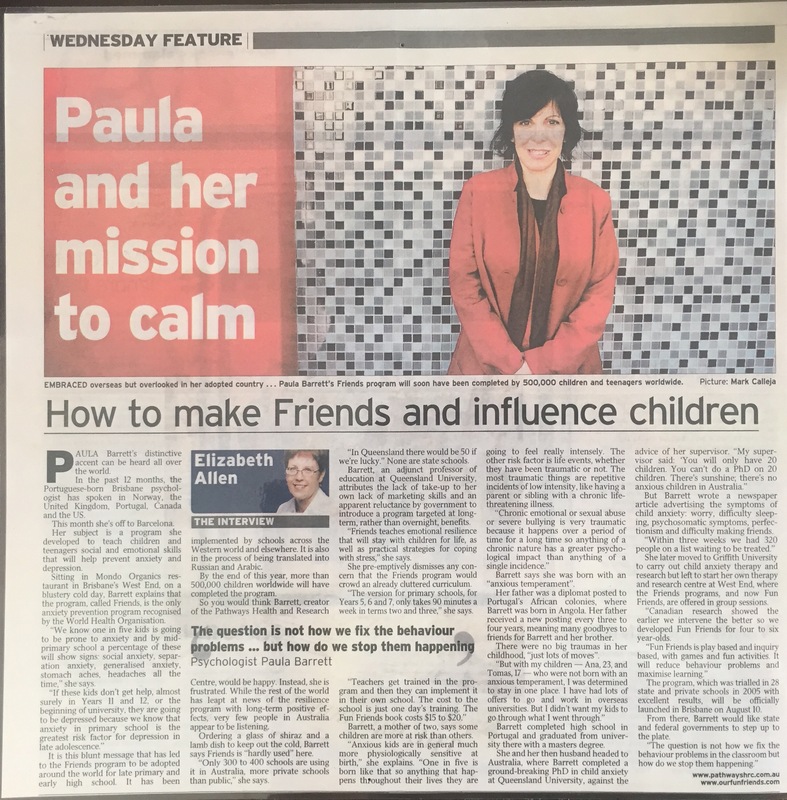 This is an article from the Wednesday Feature section and it is about how Dr Paula Barrett managed to develop the successful FRIENDS programs. “Paula Barrett’s distinctive accent can be heard all over the world. In the past 12 months, the Portuguese-horn Brisbane psychologist has spoken in Norway, the United Kingdom, Portugal. Canada and the US. This month she’s off to Barcelona. Her subject is a program she developed to teach children and teenagers social and emotional skills that will help prevent anxiety and depression. Sitting in Mondo Organics restaurant in Brisbane’s West End, on a blustery cold day, Barrett explains that the program, called Friends, is the only anxiety prevention program recognised by the World Health Organisation. It is this blunt message that has led to the Friends program to be adopted around the world for late primary and early high school. It has been implemented by schools across the Western world and elsewhere. It is also in the process of being translated into Russian and Arabic. By the end of this year, more than 500,000 children worldwide will have completed the program. So you would think Barrett, (…) would be happy. Instead, she is frustrated. While the rest of the world has leapt at news of the resilience program with long-term positive effects, very few people in Australia appear to be listening. Ordering a glass of shiraz (…) to keep out the cold, Barrett says Friends is “hardly used” here. “Only 300 to 400 schools are using it in Australia, more private schools than public,” she says. “In Queensland there would be 50 if we’re lucky.” None are state schools. Barrett, an adjunct professor of education at Queensland University, attributes the lack of take-up to her own lack of marketing skills and an apparent reluctance by government to introduce a program targeted at long-term, rather than overnight, benefits. “Friends teaches emotional resilience that will stay with children for life, as well as practical strategies for coping with stress,” she says. She pre-emptively dismisses any concern that the Friends program would crowd an already cluttered curriculum. “The version for primary schools, for Years 5, 6 and 7, only takes 90 minutes a week in terms two and three,” she says. Barrett, a mother of two, says some children are more at risk than others. “Anxious kids are in general much more physiologically sensitive at birth,” she explains. “One in five is born like that so anything that hap-pens throughout their lives they are going to feel really intensely. The other risk factor is life events, whether they have been traumatic or not. The most traumatic things are repetitive incidents of low intensity, like having a parent or sibling with a chronic life-threatening illness. Barrett says she was born with an “anxious temperament”. Her father was a diplomat posted to Portugal’s African colonies, where Barrett was born in Angola. Her father received a new posting every three to four years, meaning many goodbyes to friends for Barrett and her brother. Barrett completed high school in Portugal and graduated from university there with a masters degree. But Barrett wrote a newspaper article advertising the symptoms of child anxiety: worry, difficulty sleeping, psychosomatic symptoms, perfectionism and difficulty making friends. 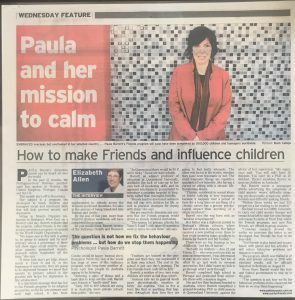 She later moved to Griffith University to carry out child anxiety therapy and research but left to start her own therapy and research centre at West End, where the Friends programs, and now Fun Friends, are offered in group sessions. “Canadian research showed the earlier we intervene the better so we developed Fun Friends for four to six year-olds. The program, which was trialled in 28 state and private schools in 2005 with excellent results, will be officially launched in Brisbane on August 10. From there, Barrett would like state and federal governments to step up to the plate.